6:09... no "Instant Karma" or Justice here... just a clown driving the wrong side of the road. Why include in this compilation? Why do bikers think they are cops? In Australia, "hooners" have their vehicles impounded. Do people actually take driving tests in Russia/Eastern Europe? Yes they do. In fact last year there were nearly 7 passes. I didn't know that there were Russians that listened to American Country Music 🎶. Just proves what bad taste they have in music as well as cars. 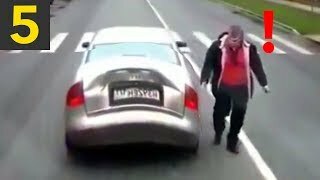 Is every driver in Russia ON crack??? Is EVERY windshield in Russia cracked?? Yep, just like here in Alaska. It’s because during the winter, we use sand & gravel on the roads. Salt doesn’t work in sub zero temperatures. RegularSize Russ most windscreens are broken where I live in NW Ontario. Yes I’ll go right now!! The guy at 0:28 complains about someone running a red light then turns right in a left indicated lane. You couldn't make it up. +Jon Hunt OK Thank you. Initially I thought that too, however the reason he makes that improper right turn is because there was a cop there who he yelled out the window " they just ran the red light"
Maybe you should get out of YouTube and spend some time with an English tutorial because talk about "stupid." 4:55 To all you 2Aers out there... that’s why your water pistols are useless against cars. Police officer in Vegas begs to differ. Just have to shoot the driver. WHY? to many people flaunt the law thinking its ok to break it and continue to do so because nobody challenges them. +Gappie Al Kebabi And yours is very intelligent! Thank God for smart people like you! Anyone else check facebook at 2:05? 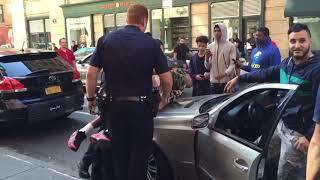 Love that clip of the cop taking down that kid who was taking off his shirt to jump the cop holding his buddy lmfao. You don't need to take off your shirt to fight. In fact, almost don't. It is his way of showing off that he is tough. Those that are, don't have to prove it. They just put you in the hospital. A happy thing came out of that. When they were jailed his friend saw the film of him taking off his shirt to help him and realised the love that took to do it, they fell in love and became lovers, they got outta jail and had a civil partnership, they now have good jobs, a son and live a great life. True story. 4:30 is an excellent example of awareness and using your vehicle to escape the danger zone. Fortunately the theifs were not willing to kill for the car. They wouldn’t have been able to. Water pistol bullets lose a lot of energy and accuracy through glass and aren’t anything against 2 tons of steel. I’ll win against a pistol wielding assailant with a car every time. Singapore is so last year. Singapore is a city not a country.